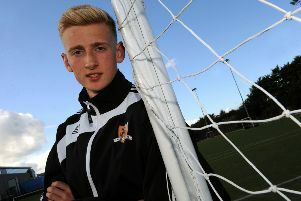 Cammy Keith grabbed a hat-trick in Formartine's 6-0 win at Huntly. Formartine United emerged from a seven-week lay-off to dispatch Buckie Thistle from the Highland League Cup. United eased into the quarter-final with an impressive 4-2 win at Victoria Park on Saturday. The Pitmedden side looked fresh and took the game straight to the Jags from the outset...their reward is a home tie against Cove Rangers. With only minutes gone, it was clear that with Bagshaw running with the ball in midfield and Anderson threading passes through gaps and producing a range of chips and flicks past defenders to reach the front two of Madle and Keith, Buckie were struggling to cope with Formartine’s pace and pressure. An early goal looked on the cards and United duly took the lead in the 17th minute when Madle broke free and squared for Cammy Keith to rifle the ball past Burr. Formartine kept up the pressure and eight minutes later Keith returned the compliment for Madle to score from close range. United should have added to their lead before half-time but failed to do so, and paid the price. Andy Low got in behind the defence and as Shearer tried to close him down, he neatly chipped the keeper who got a finger tip to it, but not enough to keep the ball out. The Jags started the second half pressing for an equaliser, but Formartine weathered the storm and steadily gained the upper hand again. The visitors made it 3-1 in the 69th minute when Madle prodded the ball home from a goalmouth scramble. That should have made things comfortable for United, but back came Thistle and pulled another goal back a few minutes later from a softish penalty award. Fraser was impeded by Smith and Hegarty stepped up to make it game on. The Jags were reduced to 10 men when Hegarty was sent off for two bookings and three minutes from time United wrapped the tie up. Captain Hay picked up the ball inside the box and struck it low and hard past Burr, producing a scoreline that the visitors’ performance merited. Buckie Thistle: Burr, S Wood, MacRae, Hegarty, D Wood, Cheyne, Angus, Munro, Fraser, Low, Copeland. Substitutes: MacMillan, Baxter, Gauld, Davidson, Stewart, Carrol, Strong. Formartine United: Shearer, McVitie, Smith, Jeffrey, Hay, Clark, Napier, Madle, Keith, Anderson, Bagshaw. Substitutes: McKay, Dingwall, Duguid, Watson, Doak.